When a child comes into our lives, it is a beautiful, joyous time. Every moment is precious. Except paying for all that baby gear. After a while, it can get expensive. Take advantage of a big sale from The First Years. Right now, all The First Years products are 10% off at Target.com. This sale is valid through August 24. The First Years offers a wide variety of baby products that can make a new mom's life easier. 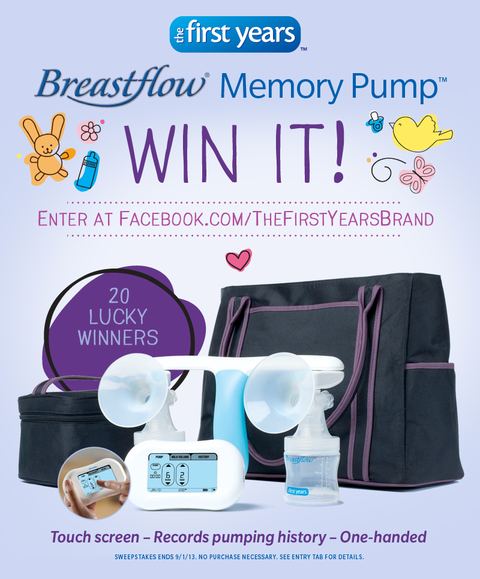 One of its award winning items is the The First Years Breastflow® Memory Pump. Here is some info on this latest technological advancement. The First Years® Breastflow® Memory Pump is designed to make breastfeeding more comfortable and efficient. It features an easy-to-use digital touch screen that automatically tracks and stores data for up to 10 sessions, automatically recording important information including the date and time, suction and speed. For a complete profile, mom can enter milk volume for each session. Plus, the unique handle allows double pumping with one hand. Breastflow Memory Pump comes with a custom designed tote bag, plus a cooler bag with removable ice pack, two 5oz. Breastflow bottles with storage lids, 2 sizes of Flexi-fit™ breast shields and a rechargeable battery pack for ultimate portability. MSRP: $179.99, now available in Target stores nationwide and on Target.com. Start a child's and mom's beginning days off to a great start with The First Years products. Disclosure: I received information about this promotion from the company. While I have a relationship with this company, I was not compensated for this post.